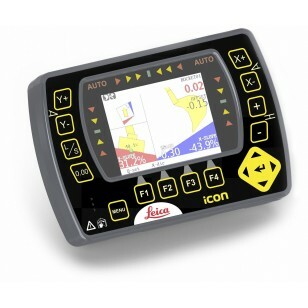 Leica iCON grade iGx2 will revolutionize your construction process. It not only boosts your productivity and performance, it also offers unmatched flexibility and upgradeability. Leica iCON grade iGx2 can dramatically increase machine utilisation, productivity and optimize material usage on any earthmoving and fine-grading contract. It can be used with a wide range of sensors and combines ease-of-use, unrivalled flexibility with very powerful and intuitive user interface. The key to the Leica iCON grade iGx2 system lies in our unique PowerSnap™ concept – a single docking station allowing easy and quick exchange of panels, depending on the job you need to do. Just snap the control panel into place and get to work. Easy removal of key components for overnight security. Why be forced into buying a complete dozer or grader system for each machine in your fleet? Leica Geosystems' unique Snap-on and Snap-off capability allows you to change from one configuration to another as the job demands. The Leica iCON grade iGx2 system is easily upgraded and fully scaleable from basic 2D to full 3D. The Leica iCON grade iGx2 system provides automatic control of both slope and elevation. Adding an extra mast and laser sensor even allows work independently of the slope direction. The system is ideal for contractors who want to further increase their machine productivity working with an easy-to-use, high accuracy grade control. Automatic side-shift control for motorgrader moldboards with our unique Tri-Sonic technology. Works right off curbs and stringlines! Automatic power down when the control panel is removed. Machine specific settings are permanently stored in the docking station.